LOS ANGELES (December 10, 2014) – Helinet Aviation Services, a diversified flight services company, announced today the addition of Los Angeles-based helicopter charter company Briles / Executive HeliShares. The deal combines the charter operations of Southern California’s two largest helicopter operators for the premium market, creating a single-source provider for Fortune 500 companies, heads of state and celebrities across the region. With the addition of the Briles / Executive Helishares business and its fleet of AgustaWestland 109 luxury helicopters, Helinet consolidates its position as the West Coast’s premier charter and management company for VIP clients. 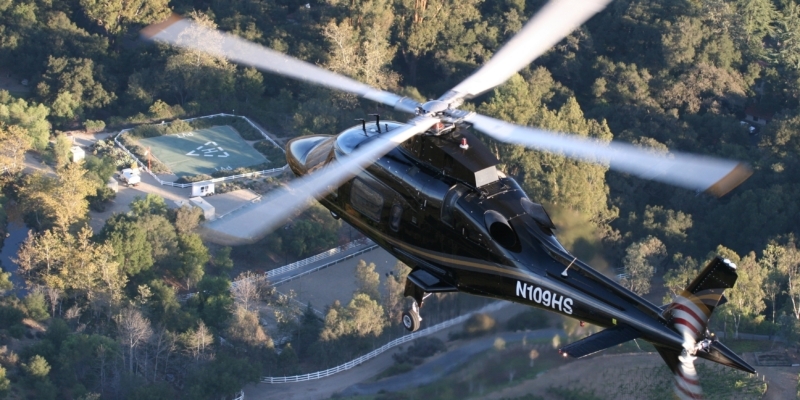 Recognized as one of the industry’s most powerful, spacious and comfortable helicopters, the twin-engine Agusta 109 provides seating for up to six passengers with a range of more than 400 miles and a top cruising speed of 190 mph. Each of the four Agusta 109s being acquired in the deal feature luxurious, climate controlled interiors, gracefully appointed with leather seating and wood trim. Following the acquisition, Helinet will purchase two additional 109s, creating one of the largest Agusta 109 charter fleets in the country. The Briles deal further extends Helinet’s existing position as the largest operator of twin-engine helicopters in Southern California and builds upon the company’s pioneering track record in the premium helicopter charter space. Since 1987, Helinet has been the first choice of business executives, world leaders and celebrities for unparalleled service, safety and comfort. Amenities include limousine / ground transport for all destinations, catering services and an extensive network of off-airport landing sites, among others. Helinet also provides 24/7/365 in-house dispatch and a flight coordination team with state-of-the-art weather and flight following systems. Helinet Aviation Services is an international provider of aviation services to a diversity of markets. Founded in 1987 and based in Van Nuys, California, the company serves clients in the broadcasting, government, law enforcement, medical, motion picture and transportation industries. Helinet is online at http://www.helinet.com.